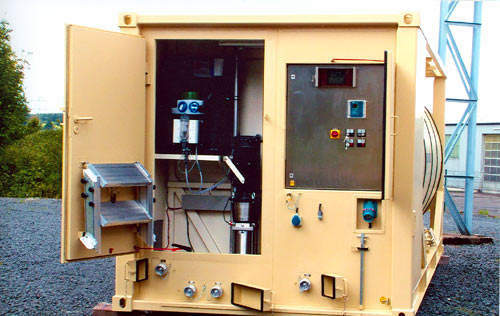 THIELMANN WEW is a world leader in containerised fuel and water systems for the military and civil defence markets. Ranging in size from 200L to 50,000L, THIELMANN WEW pressure vessels are approved to transport and store fuel and water across air, land and sea logistics chains worldwide. THIELMANN WEW’s ISO-based solutions are compatible with US and European palletised load-handling systems and can be transported on 6×6, 8×8, 10×10 logistics vehicles. Low-profile solutions for 4×4 vehicles are also available. The THIELMANN WEW advantage lies in the company’s engineering excellence. All our container systems are built to meet specific customer requirements, and can be 100% tailored to meet operational envelopes. In addition to building tanks to the highest standards, THIELMANN WEW specialises in complex pumping and preservation for water supply and refuelling of land and rotary / fixed-wing assets. THIELMANN WEW supports these systems through their entire lifecycle (25 years or more), supporting, repairing and maintaining equipment as needed. THIELMANN WEW’s fuel storage and dispensing systems are available in payloads ranging from 2,000L to 45,000L for transport on low profile 4×4 vehicles up to large 10×10 logistics trucks. 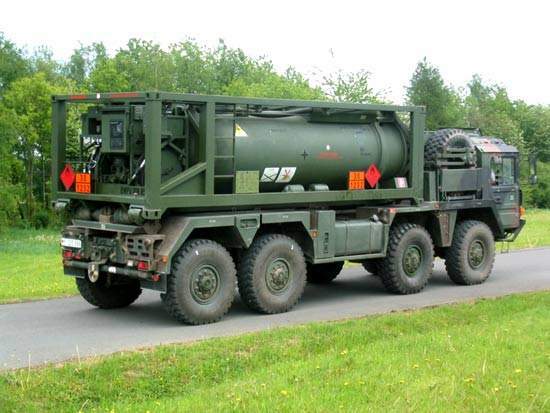 These self-contained fuel systems are fitted with integrated pumping systems, providing all equipment needed to store and dispense fuel as part of a vehicle-mounted transportable solution, including ILHS / DROPS / PLS or as a ‘drop and go’ camp, vehicle and aircraft fuelling solution. 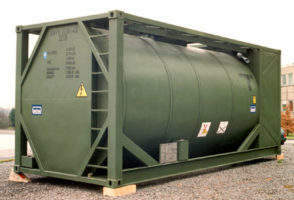 The double-shelled self-bunded stainless tanks require no site preparation, fulfil all environmental requirements and are designed to be dispensing fuel within minutes of their arrival on site. Since 2000, WEW THIELMANN’s fuel solutions have been delivered to German, UK, Belgian, Saudi, Austrian, Lithuanian, Estonian, Slovenian and Irish Armed Forces. THIELMANN WEW’s water container solutions are designed to provide potable water for deployed operations, ranging from 2,000L to 40,000L. Tanks can be equipped with on-board filtration / reverse-osmosis, heating, cooling, automatic chlorination, UV radiation and pressure regulating accumulators to provide for the transport, storage and purification of potable water. Compatible with on-board vehicle cranes, ILHS/PLS/DROPS or forklift handling systems, THIELMANN WEW’s water container systems provide a complete logistics solution for 4×4 vehicle / trailer for deployed operations, right up through medium and heavy vehicle-mounted, to a complete potable water ‘drop and go’ camp installation. THIELMANN WEW’s water container solutions have been delivered to the US Army, German, Swedish, Belgian, Slovenian, Lithuanian, Irish and UAE Armed Forces. THIELMANN WEW’s container systems are certified to store and transport more than 1,800 hazardous liquids, toxic gases and dry-powder bulk across logistics chains worldwide. We offer payload ranges between 1,000L and 45,000L and specialise in the supply of bespoke products usually within, but not limited to, an ISO footprint. Our expertise extends to the welding and manipulation of high-value alloys, including Hastelloy and Duplex. Options include heating / cooling, integral pumping, lining and THIELMANN WEW’s patented ‘flask in a tank’ system. Solutions meet or exceed all regulatory requirements and THIELMANN WEW carries ASME VIII R, U, T, as well as many national-specific certificates such as US DOT, SELO and WHG. THIELMANN WEW recently fulfilled an order placed by Saab in August 2018 with the delivery of a fuel storage and distribution system. 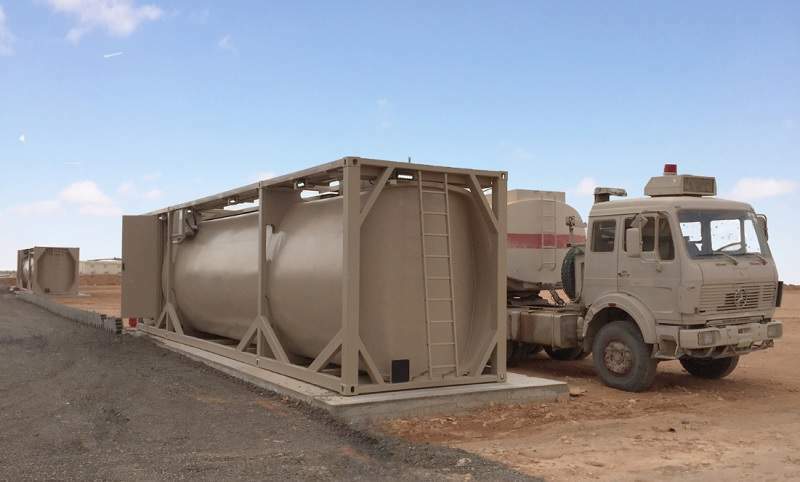 The Belgian Ministry of War and Ministry of National Defence sought to acquire new fuel tank containers in October 2014 under an open competition. 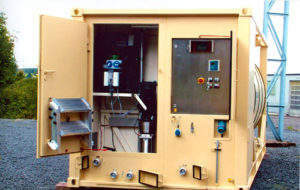 Low-profile fuel systems that can be carried on MRAP utility vehicles, trailers or standard 4x4 and 6x6 logistics vehicle beds. 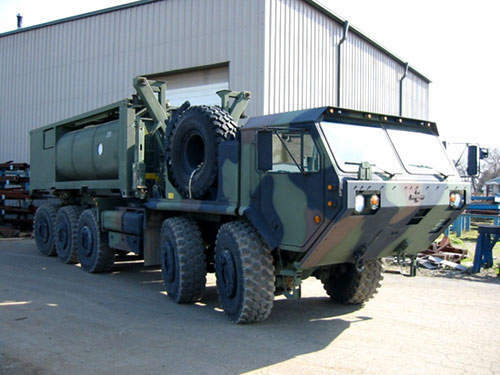 Low-profile water systems that can be carried on MRAP utility vehicles, trailers or standard 4x4 and 6x6 logistics vehicle beds. 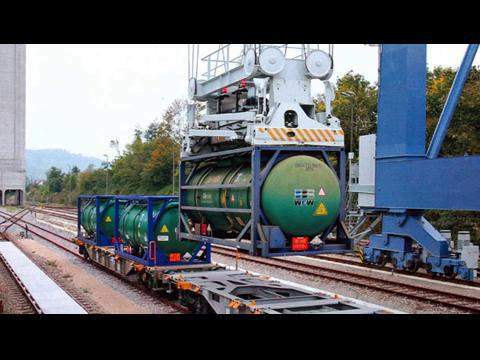 The heavy vehicle module - fuel (HVM-F) is a 'drop and go' fuel delivery and dispensing system for forward areas with capacities of up to 14,000L. The heavy vehicle module - water (HVM-W) is a 'drop and go' water supply system with capacities of up to 10,000L for the storage, preservation and distribution of potable water. 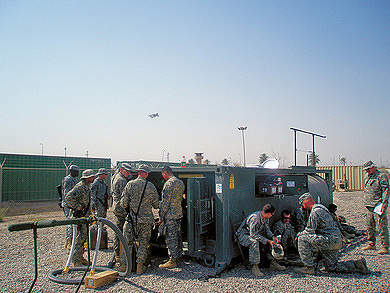 THIELMANN WEW supplies fuel and potable water storage and dispensing systems for camp and base infrastructure and military airfield facilities, with unit capacities of up to 22,500L/20in, 40,000L/40in and beyond. WEW looks back on another successful year at Eurosatory 2014. Fully multimodal, the HVM-F range provides an ILHS/PLS-compatible 'drop & go' delivery system for rapid refuelling of land and air assets in forward operating areas. WEW Container Systems GmbH has changed its name to THIELMANN WEW GmbH following THIELMANN's acquisition of WEW Container Systems in 2016. The name change will be effective as of 25th January 2019. THIELMANN WEW will once again be attending IDEX 2019 in Abu Dhabi, UAE, on 17-21 February to present its military fuel and water capabilities. THIELMANN WEW will present its military fuel and water capabilities at IDEX 2019 in Abu Dhabi, UAE from 17-21 February. THIELMANN has announced the acquisition of cleaning, maintenance and container inspectors CONTek IBC-Service GmbH. WEW, a THIELMANN company, signed a teaming agreement with Australia’s Global Defence Solutions (GDS) at Eurosatory in Paris on 13 June 2018. 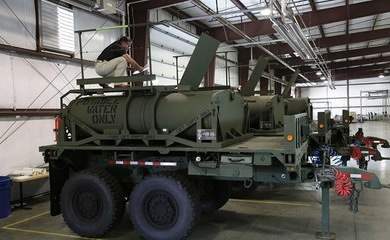 WEW, a THIELMANN company, has signed a $27.5m contract to supply new Hippo water container systems to the US Army. WEW, a THIELMANN company, has expanded its deployable fuel and water storage and distribution system portfolio with two new products designed to maximise affordability for the customer. WEW, a THIELMANN company, has been awarded a contract by the Belgian Ministry of Defence to deliver 36 Deployable Fuel Distribution Capacity (DFDC) tank containers to the Belgian Army. THIELMANN – The Container Company, is pleased to announce that it has introduced keg servicing operations in the US as part of its growing presence worldwide. THIELMANN WEW took part in a webinar led by Shephard Media on fuel and water supply in Afghanistan and beyond. It was a great discussion, led by Shephard Media’s logistics editor, Scott Gourley, and featuring THIELMANN WEW’s Falko Pfeuffer and Peter Hughes, and Ross Smith from the NATO Support and Procurement Agency (NSPA). A great listen for all stakeholders in the water and fuel logistics sector. WEW Container Systems, a THIELMANN company, has received a contract to deliver additional Camel low-profile water tank modules for the US Army. Approximately 20 mobile fuel dispensing racks have entered service with the Austrian Bundesheer following the completion of trials and training. Emirates Defence Industries Company (EDIC) subsidiary NIMR Automotive has unveiled its latest vehicle platform, the HAFEET 620A at the the International Defense Exhibition and Conference (IDEX) 2017 in Abu Dhabi. The firm provides systems and solutions for the safe handling of fuel, water, lubricants, and other liquids including waste anywhere in forward-operating areas, field camps, and airfields. Efficient movement of liquids from the "fort to the frontline" is at the core of the WEW display during the annual AUSA meeting being held at the Walter E Washington Convention Center, Washington DC from 13 to 15 October 2014. 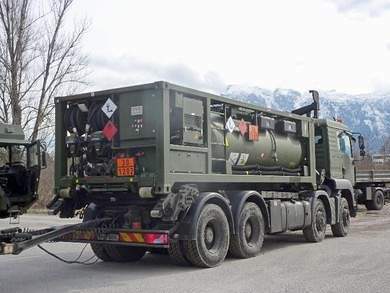 Launched today at Eurosatory 2014 is a highly mobile fuel module suitable for diesel or kerosene and able to be carried on the load bed of vehicles with a payload of at least 5t. 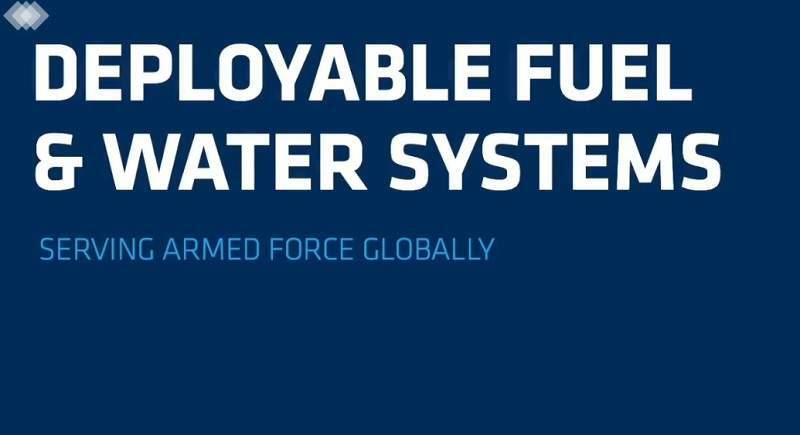 Contracts worth more than €1m have been awarded by the German armed forces to WEW, the leading suppliers of deployable fuel and water systems. All round capability in transporting fluids are on display on the WEW stand at DefExpo being held in New Delhi from 6 to 9 February 2014. A new concept in mobile, modular water systems for the German Bundeswehr is being shown on the WEW stand, booth number Hall E - 7617, during AUSA in Washington DC from 21-23 October 2013. The concepts of contracting for availability (CFA) and contractorised logistic support (CLS), which provide users with the latest versions of equipment only when they need it, will be at the core of WEW's presentation at DSEI, 10 - 13 September, on stand S6-364. Contracting for Availability (CFA) will be at the core of WEW's display on stand C2-7 during DVD being held at Millbrook, Bedfordshire on 19 and 20 June 2013. 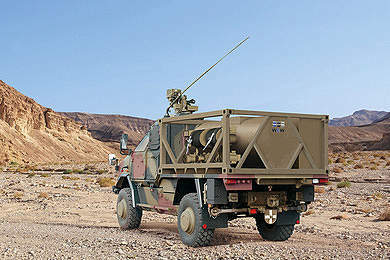 Highly mobile fuel and water systems will be on display in Hall 09, stand A02 during IDEX 2013, in Abu Dhabi on 17-21 February. Peter Hughes of WEW to explain the importance during the Land Warfare Conference in Melbourne, Australia. Water delivery solutions form the core of WEW's display on booth 8017 during AUSA 2012, being held at the Walter E Washington Convention Center, Washington DC from 22 to 24 October 2012. 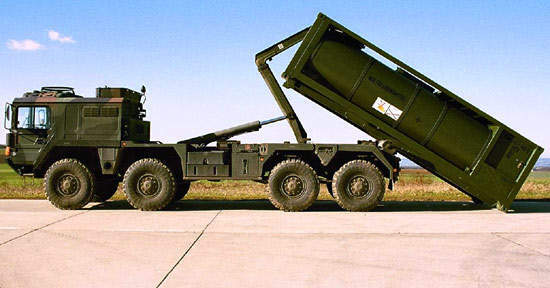 Following the award of a contract to supply 300 units the first units start extensive trials. Fuel and water logistics solutions from WEW are on display on stand SP-25 at DVD being held at Millbrook Proving Ground, Bedford on 20-21 June, 2012. On stand B320, situated in the outside area, WEW will be demonstrating its capabilities in modular fuel and water logistic systems at Eurosatory being on 11-15 June, in Paris. Speaking at the Defence Logistics Conference, which will be held in London from 26 to 28 March 2012, Peter Hughes, business development manager for WEW, the fuel and water solutions company, will call for commonality and interoperability in fuel and water systems to be adopted. A modular, MOTS approach should be adopted for fuel and water logistics on the battlefield claims Peter Hughes, business development manager at WEW.